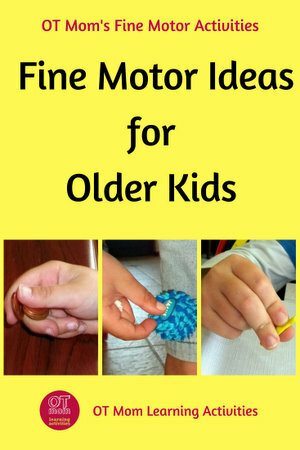 Older children require a slightly different approach with fine motor skills activities. Fun activities that delight younger kids may be just "not cool"! And often traditional suggestions such as origami, beading and woodwork are frustrating because the child simply does not have the skills to get a decent end result on par with their peers. As kids get older, through middle school and junior high, we need to get a bit creative to find ways to work on hand strength and dexterity in a way that is not boring or patronising. On this page, I am sharing ideas that can work in homework time, or in a homeschool schedule. Some of my readers have even used them as a warm up before music lessons! If you are concerned about your child's fine motor skills, please get a professional Occupational Therapy assessment. The activities on this page are not a substitute for therapy! Use these quick links to jump to a section that interests you, or browse them all! These fine motor activity ideas can be used as a quick break between school tasks or before beginning a handwriting or music lesson. Crumple a sheet of newspaper or scrap paper in the hand until it is a tight ball. Try to do it while holding the hand in the air. That way, the fingers work harder! Tip: Do this whenever paper needs to be discarded - wad it up and toss it in a basket! Use the fingers to “walk” a small ball up and down the legs. Your child could walk the ball up one leg, across the tummy and down the other leg. Most kiddies balls work well. Make it harder: Ask your child to use just the tripod fingers (thumb, index and middle fingers) to walk the ball. Using a basic kids' beanbag, position the fingers under the beanbag, holding it level. Keeping the bean bag level, slowly rotate the bean bag 360 degrees, using the fingers and thumb to manipulate it. You could also try using a small bag of dried beans, popcorn or rice, if you don't have a beanbag on hand! Have your child hold some coins in the hand and then work them up to the fingers one by one to push them through the slots of a money bank. Side slots get the fingers working hardest. Tip: Recycle a container to use instead of a money bank! Keep the resources for these activities in a handy container to access whenever your child needs a break during schoolwork/homework. Here's what your fine motor skills activities box could look like! Plasticine (modeling clay) is a lot stiffer and harder to work with than playdough, which makes it the ideal challenge for kids in middle school and older. Here are some ideas that you can encourage your older child to do with plasticine! Using the “tripod” fingers (thumb, index and middle fingers), roll the blob into a neat ball. If your child struggles to isolate the tripod fingers, have them hold down their ring and little fingers like this, or ask them to hold down a scrap of paper with those 2 fingers. If rolling the balls is too hard, then try making sausages with a simple back and forth motion of the tripod fingers. Your child can then use the balls as part of a model, or simply make 10 balls as a daily exercise. You'd be surprised at how many older kids and teens struggle to cut neatly with scissors! I always emphasise the importance of cutting with scissors for preschoolers, but exactly the same principles apply for older kids! Cutting with scissors strengthens the hand muscles, and also helps the child to isolate the movement of the tripod fingers (thumb, index and middle fingers for holding the pencil) from the rest of the hand. 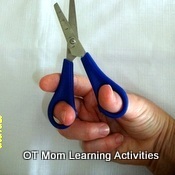 Getting lots of opportunities to cut with scissors can help improve your child's fine motor skills. Whenever you need something cut out, ask your child to do it - whether cutting open packets of food, cutting work related papers, snipping festive decor or cutting gift wrap, call your child to do it! Try kirigami - this is the art of cutting and folding paper, and some examples on this page make lovely decorative ideas. If you are really stuck for scissor cutting ideas, you could try some of the downloadable e-books on this page of my site - lots of fun end products that can motivate reluctant kids to cut with scissors. Use scissors that are a step up from kiddy scissors, but not too large. Adult 5.5inch scissors used for crafts are also good - remember to exercise caution with sharp scissors! Pocket Full of Therapy have a really fantastic little kit called the In-Hand Manipulation Kit. It was put together by an Occupational Therapist and contains a variety of objects that you can use to challenge an older child. I personally find it very helpful to incorporate fine motor skills activities into my kids' daily routine. In this way, they see the activities as hand exercises, rather than "activities". As homeschoolers, we tend to do them before handwriting tasks. Kids who attend school can do them as a regular part of their afternoon activities, such as before settling down to homework, or after an afternoon snack. I hope you found this page helpful! Please do stay in touch by signing up for my occasional newsletter!